There was bit (okay a lot) of debate on Facebook yesterday with a ‘popular’ dietician/nutritionist recommending a new range of Up and Go packaged breakfast drinks for children who don’t eat breakast. I have talked about these drinks before when another nutritionist recommended the Coco Pops drinks. Sorry but I have to put this out there yet again. It’s so confusing for people when ‘experts’ in the mainstream media do this. Who are we supposed to believe? Well, I think it’s important to educate yourself. Learn how to read labels, learn what ingredients are and make your own informed decision on what to feed your family. I know that takes time and effort. But, our kids are worth it! Their bodies and brains are growing and developing and they need the best possible nutrition. Well nourished children do better at school, at sport and are better behaved. My best tip is to get yourself a copy of The Chemical Maze handbook. It is a quick reference guide to all sorts of chemicals in our food and will give you an instant answer. Okay, so back to the packaged breakfast drink. Let’s take a look at the ingredients. Filtered water, skim milk powder, cane sugar, wheat maltodextrin, soy protein, vegetable oils (sunflower, canola), hi-maize™ starch, corn syrup solids, inulin, fructose, cocoa (0.5%), cereals (oat flour, barley beta glucan), minerals (calcium, phosphorus), food acid (332), flavour, vegetable gums (460, 466, 407), vitamins (C, A, niacin, B12, B2, B6, B1, folate), salt. Filtered water, wholegrain oat flour (3.2%), skim milk powder, cane sugar, fructose, soy protein, inulin, milk protein concentrate, vegetable oils (sunflower, canola), flavours, cocoa (0.5%), mineral (calcium), food acid (332), vegetable gums (460, 466, 407), stabiliser (452), salt, vitamins (C, A, B3, B12, B2, B6, B1, folate). There is not much I like in these products. Kids should be having full cream milk for all the good fats. Refined sugar is high up on the list, followed by fructose. Keep in mind that vegetable oils are likely to be heavily processed and genetically modified and that the vitamins added are synthetic. A whole world of nastiness in a cardboard box! Let’s not even mention the expense of these drinks and the environmental concerns of all that packaging. Yeah, I am not a fan. Maybe once in a blue moon, but certainly not an option for breakfast every day for my kids. 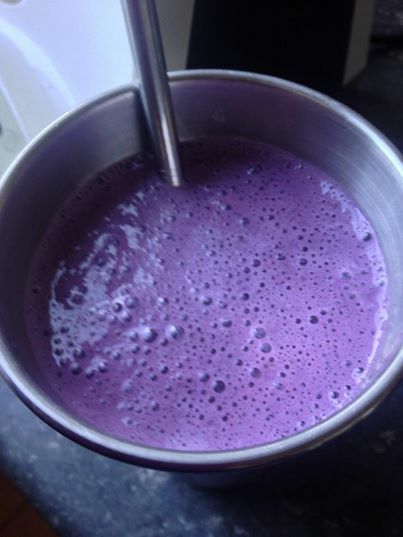 This is the breakfast smoothie I made for my kids today. It’s really not hard or time consuming. If you are pushed for time, have all the ingredients ready to go in the blender and store in the fridge overnight. Heck, you don’t even have to wash up the blender, just rinse it out and leave it until you get home! Throw in a blender or thermomix some banana, blueberries, organic milk, greek yoghurt and a generous spoonful of Nutra Organics Exotic Vanilla Protein powder. You don’t need a recipe, just add stuff and taste test if needed. If you are dairy free, simply use the milk substitute of your choice (or coconut water) and coconut yoghurt. My kids do a lot of sport and are growing at an alarming rate, so we are finding the protein powder really fills them up and helps keep them satisfied until lunch time and I know they are also getting their vitamins and probiotics in the same drink. Winner. What do you think about these packaged breakfast drinks? What do your kids eat for breakfast? I would love to hear your ideas. Love it! You don’t just state the problem, you provide a solution too. My kids love a smoothie with breakfast, I never thought to add protein powder to it. We do something very similar, but usually adding rolled oats as well. And our 3.5 yr old son always helps, so helps make his own breakfast. 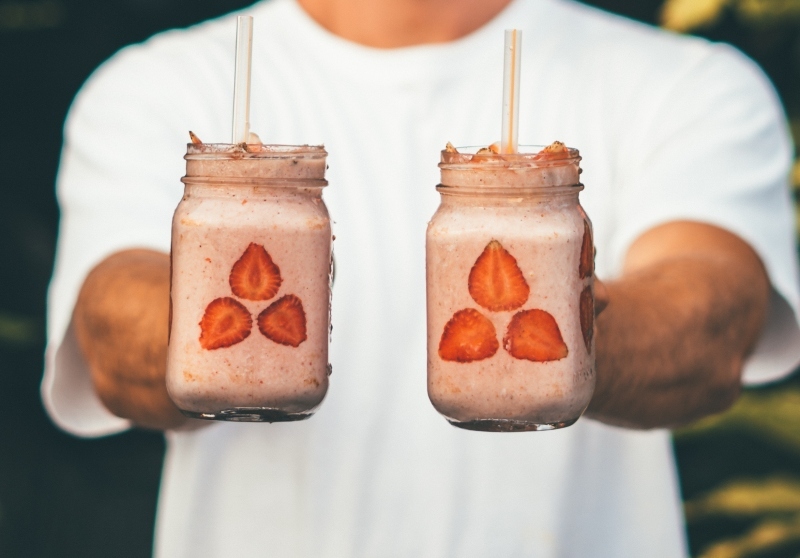 I agree with everything you said in this article, my 14 year old daughter stopped eating breaky and lunch a year ago because of bullying at school so I started making her breaky shakes very similar to the one you make your kids, I don’t have any protein powder so I add oats, linseeds, almonds, dates and sunflower seeds. My daughter is now happily eating breaky and is home schooled so she eats lunch too. Friends told me milkshakes arnt enough for breaky so I had to explain to them that I don’t make milkshakes I make breakfast shakes with more in them than most breaky cereal! It’s hard to explain to someone why I had to do it. My 13 year old homeschool’s too and eats so much better at home, he makes a huge porridge with fruit, eats fruit for snacks, and has a salad and protein lunch he makes himself, so not only is he learning to take care of himself learning to prepare food, he keeps himself healthy. These types of drinks are full of wheat, fat, sugar and rancid ingredients. They are designed only to profit the companies that make them. Just don’t buy them ever! Processed food is what is making everyone get sick ‘eventually’. The combination of fats and sugars are chemically balanced to trick your tastebud’s into wanting more, it is what makes them moorish. Too much wheat and dairy in the diet causes bloating, upsets tummies and sometimes makes you grumpy.Going back to wholesome, natural and fresh food is the only way to keep healthy and help your kids grow up strong and healthy. Well said! I’m just glad there are people like you who are willing to stand up and speak the truth. Thank you!! Ah ha! I seem to have seen some of the tail end of that on Facebook – now it makes sense. I recall about five years ago when I used have Up and Go for breakfast, thinking it was a healthy choice, and now I wouldn’t go near the stuff. It is truly eye-opening when you become educated about your food choices. But, I have to say that I am in the camp of people who is often left with my jaw wide-open at some of the recommendations that dietitians make. My daughter (just turned 5) has either porridge & berries or an egg on toast for breakfast. We use wholegrain raw oats and a little water to make the porridge .. and top it with milk to make it creamy. The berries I buy fresh (when possible) and store in the freezer in a zip lock bag so we can just get out what we need. She also makes her own ‘bircher’ muesli .. using oats, fresh fruit and yoghurt and soaks it overnight. Love this post! I posted a rant on my personal facebook yesterday, sharing this today to spread the “gospel” of fresh food is best! Alarmingly on Sunrise this morning an expert was talking about the ADD & ADHD Ritalin prescription rate rising from 150,000 prescriptions… and we wonder why? NOT! JERF! Because some big processed food companies also own shares in the pharmaceutical businesses. We have never bought those things for our kids. I have never agreed with them. As some one said a few comments back…REAL FOOD is the way to go. My kids 4yrs and 15months, eat egg on toast, porridge, etc for breakfast. Miss 4 loves breakfast smoothies! I have no faith in the DAA with advice like this of course we have an obesity epidemic on our hands. Totally agree Sonia! FOUR types of sugar and several thickeners, yuk. Most days I make 1 big smoothie for myself hubby, Mr 2yo & Miss 8mo. Few more ingredients than yours so does take time but u save time by pre-blending then freezing the greens into ice cubes (kale, spinach, brocolli, cucumber etc). Sweeten with banana and berries, plus chia seeds, lsa, coconut oil, pea protein, coconut milk. Toddler loves it, bub often won’t drink much but does like it. Much healthier! Thanks Sonia, I love your blog and the information you share. We have a vegie smoothie or juice each morning and then either chia seed porridge, quinoa porridge, fresh nut muesli w fruit or homemade granola. My 19 month old and 3.5 yr old love to help. I love that they have no packet recognition as they have never seen any commercial cereals. Thanks for your advice and inspiration on our journey. Totally agree with you Sonia. I’ve never bought a pre-packaged breakfast drink for myself, let alone my kids and I never will. You’re right, it isn’t hard to make a simple, nutritious breakfast. I read through the ingredients list and was cringing. I have a brother who can’t have artificial ANYTHING and I am gluten and dairy free.